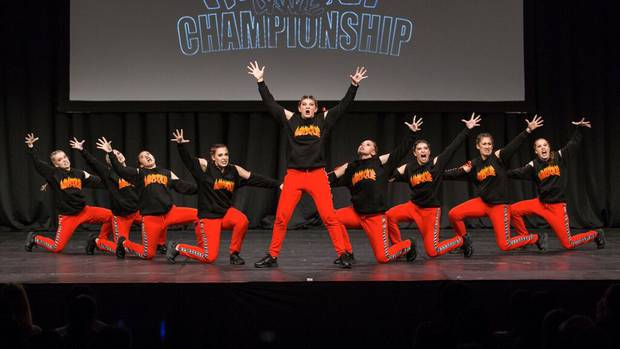 If you thought hip hop dance was just for teenage boys wearing baggy jeans, oversized T-shirts and lots of bling, you should have been at Hip Hop International (HHI) New Zealand finals. Electric and entertaining, it was a packed evening of high energy performance with styles from classic b-boying, locking and popping to twerking, krumping and, of course, punking and waacking. Despite the rain, more than 2000 turned out to support their teams: 84 crews from across the country. During four hours, 1000 dancers took to the stage in a fierce battle to see who would represent New Zealand at the Hip Hop International World Champs in August in Phoenix, Arizona. Representing some of the top dance schools and companies, the floor was alive with tracks from the 1980s (the night started off with the tunes from the Fresh Prince of Bel Air) and current electronica, hip-hop and techno influences. The choreography progressively got more risque but the crews that scored well were those who displayed unconventional formations, tricks and narratives. Female crews dominated the Junior and much of the Varsity categories but Swagganauts, the first all-male boy crew of the night who placed third in Varsity, lit up the stage with a powerful routine. From the Junior category, Bubblegum took first place with their contemporary pop princess routine, while Masque was awarded the number one spot in the Varsity category. In the adult section Prestige won over the crowd and were duly awarded first place; IDCO were the undisputed winners in the Megacrew category. For Arnel Calvario, international head judge from the USA, New Zealand’s hip-hop teams are exceptional.